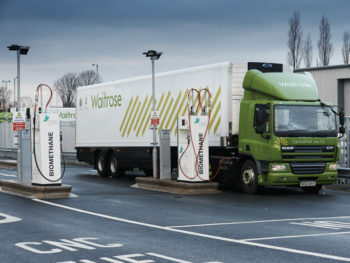 A new refuelling station and 58 Waitrose gas trucks will take part in the UK’s first large-scale trial of renewable biomethane, proposed as a low-carbon alternative to diesel. CNG Fuels is opening a renewable biomethane refuelling station at Northampton that will be used to refuel the trucks, in order to study the potential benefits of the fuel to help slash road transport emissions. The project is a part of the Low Emission Freight and Logistics Trial, and is part-funded by the Office for Low Emission Vehicles (OLEV) in partnership with Innovate UK, is aimed at encouraging fleet operators to switch away from diesel. The trial will ultimately involve 300 trucks across the UK. Renewable biomethane CNG fuel is said to be one of the most cost-effective and environmentally friendly alternatives to diesel – being 30-40% cheaper and typically reducing vehicle CO2 emissions by up to 85%. HGVs account for just 5% of vehicle miles on the country’s roads, but 16% of greenhouse gas emissions, according to a January 2017 Department for Transport report; Emissions Testing of Gas-Powered Commercial Vehicles.